At Laguna Eyes Optometry in Laguna Beach, we provide our patients with sophisticated blue light blocking lenses that can shield your eyes from direct exposure to blue light. To help prevent long-term damage to your eyes, Laguna Eyes Optometry provides state-of-the-art blue light blocking lenses and lens coatings for both children and adults. This will help protect your eyes from exposure to blue light and allow you to use your digital devices more comfortably and with significantly less soreness and eye strain. Our premium blue light blocking lens options include Zeiss Duravision Blue and Drive Safe, BluTech, Shamir Blue Zero, Hoya Recharge, and VSP Techshield blue. For our patients 15 and older, we also measure macular pigment density. BluTech pioneered the first fully-protective lenses for Blue Light. Originally marketed as computer lenses, they originally blocked all blue light, making things appear yellowish. The technology has since improved to the point that their near-clear lenses block the vast majority of Blue Light while preserving true colors. BluTech Lenses offer some of the best Blue Light protection on the market. The ZEISS DuraVision BlueProtect lenses filter out wavelengths of blue-violet that are shorter than 440nm — the range of light which is considered by eye doctors to be the most dangerous. 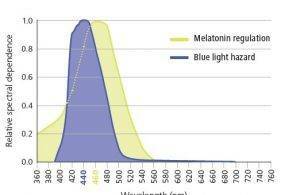 By blocking only these very high energy wavelengths, the ZEISS DuraVision BlueProtect coating protects your eyes from retinal cell damage, phototoxicity, and disruptions to your sleep cycle while allowing beneficial frequencies of blue light through. You will be protected with clear and true-color vision while still enjoying the benefits of blue light. Shamir uses a unique polymer formula to produce these high-tech lenses. The Shamir Blue Zero High Index 1.67 and Trivex lenses block up to 98% of high energy blue light in the 415-435 nm range. The Shamir Blue Zero Polycarbonate lenses block up to 50%. This allows you to enjoy significant protection from blue light while still enjoying crisp, clear, and true-color vision. On average, Shamir Blue Zero blocks about three times the amount of harmful blue light as compared to standard clear lenses. VSP's anti-reflective (AR) lens coatings are a step up from standard prescription lenses by reducing glare, scratches, and dirt build-up. The TechShield Blue is a VSP AR coating specially formulated to protect against blue light. For more information about how our innovative blue light blocking lenses can help you, get in touch with us today. Our Laguna Beach optometrists and opticians will be happy to speak with you and recommend the lens which best suits your needs and lifestyle. We also sell Healthe Eyesafe filters to place right over digital devices. 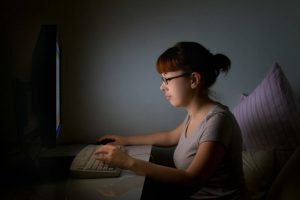 These block about 60% of the harmful blue light.